The mushrooms in this group have pink spore prints, gills that are attached to the stem, and spores that are angular, warted, or ribbed. For the most part they are saprobes that help decompose forest litter, which means that they usually grow on the ground. The pink-spored mushrooms in Pluteus, by contrast, are wood-rotting saprobes found on decaying logs (additionally, their gills are free from the stem and their spores are ellipsoid). At least one Entoloma species, Entoloma abortivum, can be a parasite on another mushroom, Armillaria mellea. Recent research (Co-David and collaborators, 2009) supports treating Entoloma as a large and diverse genus that includes what some mycologists have separated into the genera Alboleptonia, Claudopus, Inocephalus, Leptonia, Nolanea, and Pouzarella, along with the funky, gastroid genera Richoniella and Rhodogaster. 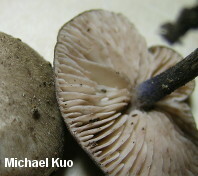 The researchers also determined that the closely related Rhodocybe and Clitopilus, which are similar to Entoloma but differ on sporal morphology (warted, rather than angular, spores in Rhodocybe; longitudinally ribbed spores in Clitopilus), must be rearranged because DNA results nested Clitopilus within Rhodocybe; since "Clitopilus" is the older of the two names, species of Rhodocybe were transferred to Clitopilus. However, authors of a more recent study (Baroni and collaborators, 2011) caution that "too little sampling has been done and too few species examined so far to make such large-scale taxonomic recombinations." Some North American species of Entoloma are quite distinctive, well established, and easily recognized. Many others, however, are hard to distinguish, even with extensive microscopic examination. Would-be Entoloma identifiers need, above all else, patience and the ability to Keep Calm and Carry On when their Entoloma collections do not match a described species very precisely. Since "patience and cool-headedness" are not likely to make the Top Ten List for anyone who knows me and is asked, "What are Michael Kuo's personality traits?" it probably goes without saying that I despise Entoloma and everything about it. Seriously. Every time I decide to bite the bullet and identify my Entoloma collections, my herbarium winds up with fewer, rather than more, identified collections. So perhaps you should not listen to me at all when I rehearse for you some of the crucial morphological features for the genus: the shape of the cap, the color of the young gills (before they turn pink), the odor and taste, and the color of the stem when fresh. Micromorphological features, which almost always have to be assessed in this God-forsaken genus, can usually be observed by removing a gill section (one that includes the edge of the gill, oriented in such a way that you do not forget which side is the true edge) and mounting it in phloxine-stained KOH--and by making a radial section of the cap (rather than the traditional Roman aqueduct section) and mounting it in 10% ammonia. 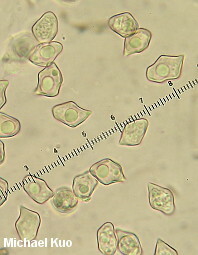 Microfeatures include spores, hymenial cystidia, the presence or absence of clamp connections, and the pileipellis elements (especially with regard to whether the pigmentation is, or is not, encrusted on the hyphal walls). Don't get your hopes up. North American Entoloma literature is replete with synonymies, poorly described species, species that were named long ago and for which type collections have been lost, and so on. The two most comprehensive treatments, David Largent's 1994 treatment of entolomatoid mushrooms in the western states, and Lexemuel Hesler's 1967 treatment of Entoloma in the southeastern states, are both hard to obtain and expensive--and in the case of the Hesler monograph, frankly, not likely to help you much. Because of these realities, one strategy used by a considerable number of North American Entoloma identifiers is simply to pretend that one is in Europe, and to use one of the very good keys to the European species (see especially Noordeloos, 1988 and 2008; Moser, 1983; Breitenbach & Kränzlin, 1995; full citations below). This strategy is often particularly useful for discovering which species group your collection might belong to--and many North American entolomas are currently going under European names. But North America is not Europe, and it is debatable whether many of our entolomas really do match European entolomas under contemporary, DNA-based species concepts. And, anyway, don't you have some nice, red russulas you need to identify? Surely that would be more productive . . .
Baroni, T. J. (1981). A revision of Rhodocybe Maire (Agaricales). Vaduz, Germany: J. Cramer. 194 pp. Baroni, T. J. & D. L. Largent (1989). The genus Rhodocybe: New combinations and a revised key to Section Rhodophana in North America. Mycotaxon 34: 47-53. Baroni, T. J. (1990). Entolomataceae in eastern North America I: new species of Claudopus and Rhodocybe from the southern Appalachian Mountains. Mycotaxon 36: 313-323. Baroni, T. J. & Horak, E. (1994). Entolomataceae in North America III: New taxa, new combinations and notes on species of Rhodocybe. Mycologia 86: 138-145. Baroni, T. J. & Lodge, D. J. (1998). Alboleptonia from the Greater Antilles. Mycologia 90: 680-696. Baroni, T. J. & R. E. Halling (2000). Some Entolomataceae (Agaricales) from Costa Rica. Brittonia 52: 121-135. Baroni, T. J., V. Hofstetter, D. L. Largent & R. Vilgalys (2011). Entocybe is proposed as a new genus in the Entolomataceae (Agaricomycetes, Basidiomycota) based on morphological and molecular evidence. North American Fungi 6: 1-19. Brietenbach, J. & Kränzlin, F. (1995). Fungi of Switzerland: A contribution to the knowledge of the fungal flora of Switzerland. Volume 4 agarics 2nd part. Transl. Walters, V. L. & Walters, J. F. Lucern: Verlag Mykologia. 368 pp. Co-David, D., D. Langeveld & M. E. Noordeloos (2009). Molecular phylogeny and spore evolution of Entolomataceae. Persoonia 23: 147-176. Czederpiltz, D. L. L., Volk, T. J., & Burdsall, H.H. Jr. (2001). Field observations and inoculation experiments to determine the nature of the carpophoroids associated with Entoloma abortivum and Armillaria. Mycologia 93: 841-851. Halling, R. E. & T. J. Baroni (1985). Rhodocybe pulchrisperma (Entolomataceae): A new species from North America. Brittonia 37: 182-185. Hesler, L. R. (1963). A study of Rhodophyllus types. Brittonia 15: 324-366. Hesler, L. R. (1967). Entoloma in southeastern North America. Germany: Cramer. 245 pp. Hesler, L. R. (1974). Name corrections in Entoloma. Mycologia 66: 715-717. Horak, E. (1976). On cuboid-spored species of Entoloma (Agaricales). Sydowia 28: 171-236. Largent, D. L. & Benedict, R. G. (1970). Studies in the Rhodophylloid fungi II: Alboleptonia, a new genus. Mycologia 62: 437-452. Largent, D. L. & Benedict, R. G. (1971). Studies in the Rhodophylloid fungi I: Generic concepts. Madrono 21: 32-39. Largent, D. L. (1971). Rhodophylloid fungi of the Pacific Coast (United States) I: Type studies and new combinations of species described prior to 1968. Brittonia 23: 238-245. Largent, D. L. (1977). The genus Leptonia on the Pacific Coast of the United States, including a study of the North American types. Vaduz, Germany: J. Cramer. 286 pp. Largent, D. L. (1994). Entolomatoid fungi of the western United States and Alaska. Eureka, CA: Mad River Press. 516 pp. Moser, M. (1983). Keys to Agarics and Boleti (Polyporales, Boletales, Agaricales, Russulales). Ed. G. Kibby. Transl. S. Plant. London: Roger Phillips. 535 pp. Noordeloos, M. E. (1979). Type studies on Entolomatoid species in the Velenovsky Herbarium�I. Persoonia 10: 245-265. Noordeloos, M. E. (1980). Entoloma subgenus Nolanea in the Netherlands and adjacent regions with a reconnaissance of its remaining taxa in Europe. Persoonia 10: 427-534. Noordeloos, M. E. (1981). Introduction to the taxonomy of the genus Entoloma sensu lato (Agaricales). Persoonia 11: 121-151. Noordeloos, M. E. (1981). Entoloma subgenera Entoloma and Allocybe in the Netherlands and adjacent regions with a reconnaissance of their remaining taxa in Europe. Persoonia 11: 153-256. Noordeloos, M. E. (1981). Entoloma subgenus Nolanea--Additions. Persoonia 11: 257. Noordeloos, M. E. (1981). Entoloma in North America. Stuttgart: Gustav Fischer Verlag. 164 pp. Noordeloos, M. E. (1982). Entoloma subgenus Leptonia in northwestern Europe--I. Introduction and a revision of its section Leptonia. Persoonia 11: 451-471. Noordeloos, M. E. (1988). Entolomataceae. In Bas et al., eds. Flora Agaricina Neerlandica; Critical monographs on families of agarics and boleti occuring in the Netherlands. Volume 1. Rotterdam: A. A. Balkema. 77-177. Noordeloos, M. E. & A. Hausknecht (2007). The genus Entoloma (Basidiomycetes, Agaricales) of the Mascarenes and Seychelles. Fungal Diversity 27: 111-144. Noordeloos, M. E. (2008). Entoloma (Fr.) P. Kumm. In Knudsen & Vesterholt, eds. Funga Nordica: Agaricoid, boletoid and cyphelloid genera. Copenhagen: Nordsvamp. 433-494. Noordeloos, M. E. & O. V. Morozova (2010). New and noteworthy Entoloma species from the Primorsky Territory, Russian Far East. Mycotaxon 112: 231-255. Ovrebo, C. L. & T. J. Baroni (1988). Three new species of Rhodocybe from Costa Rica. Mycologia 80: 508-514. Singer, R. (1979). Clitopilus. In: Keys for the identification of the species of Agaricales II. Sydowia 31: 235-237.